Good things trucks deliver to America; it’s a crazy stat that everything you have at one time in the delivery chain was transported by a truck! It may enter the country by plane, boat, or train, but it still lands on a truck in the process, and even more crazy their are millions of drivers and they still need more, in fact there is more loads that drivers, that’s amazing to me. 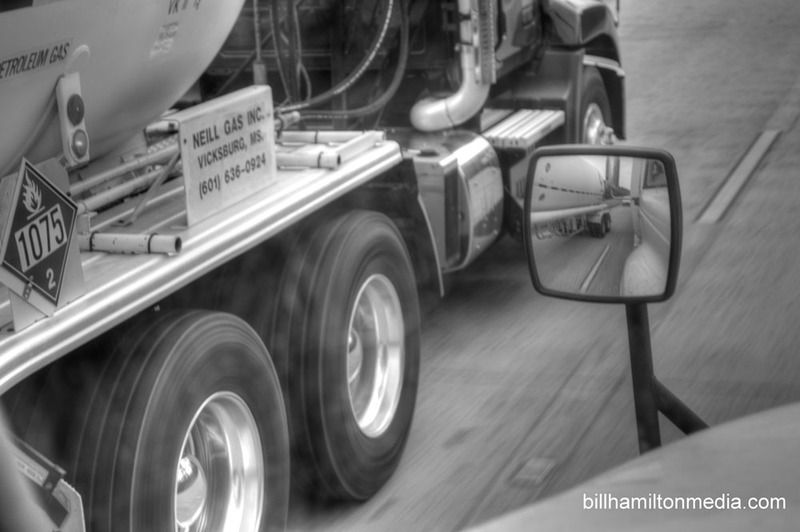 I took this picture because of the relationship between the two big rigs and how the tanker is carried through the mirror, which was a hard image to capture at 65mph going down the interstate. I admire people who can thrive in this type of work environment and still maintain a balanced home life even though they are on the road away from home for weeks at a time. If these big wheels quit rolling so does the US economy, they need each other. So, my trucker friends keep on trucking! This entry was posted in Uncategorized and tagged Big Rigs, Cities, People, Photography, Transportation, Travel, Trucking, Trucks.